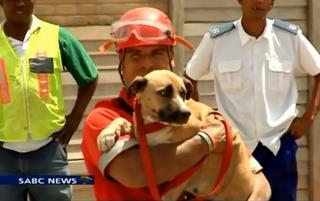 (Newser) – Some cheerful news to start the week: A massive rescue operation succeeded in saving a dog who had gotten stuck at the bottom of one of the world's biggest manmade holes, Metro reports. The pooch—nicknamed "Underdog"—was spotted last week swimming in the lake at the bottom of a gigantic South African crater known as the "Big Hole," having somehow survived the 700-foot fall to the bottom of the unused mine. "Not plane, nor bird, nor even frog, It's just little old me... Underdog!" He was sparred by one of his dogs life's and It turned out to be celebrity up for adoption. Wow, it would be awesome to live with celebrity like that.